The Sumners: Life and Times: The Queen! This picture is courtesy of my friend Lydia. The Queen and Prince Philip, Duke of Edinburgh, came to Aberdeen for the first time in 10 years to celebrate the opening of the new University Library and the remodel of the historic Marischal College building (now housing Aberdeen City Council). This was our chance to see the Queen in person, an opportunity that the kids especially were so excited to take. We hiked down to the University Library to stake our a place on the fence and waited for about 90 minutes for the Queen to come. During our wait it poured down rain and the wind whipped around us, but still we waited. We were hoping that the Queen would walk part of the way down the sidewalk leading to the library, but I think the weather eliminated any chance of that. Instead, her car just drove past us, up the the very doors of the library. All we caught was a quick glimpse of her in the passing car. The kids were disappointed, since neither actually saw her through the windows. So we braved the weather a little longer and pushed our way up to the library doors to wait for her to exit again. 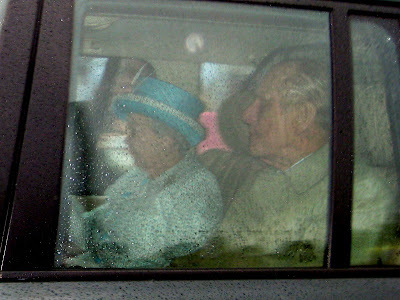 Finally, the Queen and her husband left the building and headed for their car. Abigail was up on Darren's shoulders for a good view. Joshua was being held up by a kind student near the fence; she heard his sweet pleas to see the Queen and offered to let his come to the fence line and held him sitting on the fence so he could see. Both kids got to watch her get back into her car. It was a crazy wet day, but so worth the wait. The kids (especially Joshua) were so happy and excited in spite of the fact that they were soaked. And Micah managed to sleep in the baby Bjorn the entire time. Check out the rest of my pics on Facebook. Aren't they marvellous, the Queen and Prince Phillip! Most folk their age don't venture out much any more. That pair visited Australia just last year!